This is my dad's favorite snack and when he was visiting us last year i couldnt make it for him. Today is father's day so made his favorite snack. I have tried many times but still the chillies are ended up being too hot to eat. I got an idea to soak it in the sour buttermilk for a whole day to take off the heat. Dipped in the besan flour (gram flour)and deep fried it. Serve it with chutney & it was really yummy. Also made a cake as my son wanted to make one for his dad :). Happy Fathers day to all. Feel like grabbing some hot mirchi bonda. 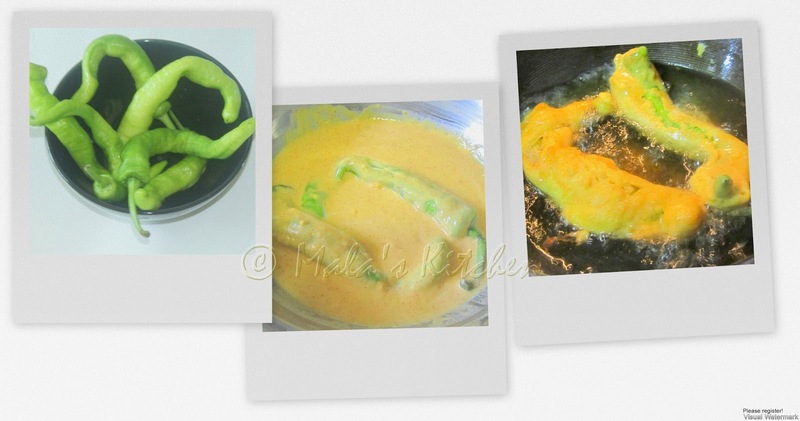 Ahaaaaaaaaaaaa the green chilly pakodas look so yummy crispy tempting and inviting. Please send me some soon. The rains have started and this would be so welcome! Dear Friends, Your blog content having good audience. Now May you make your blog to Money Making Machine everyday for you. earn .. earn every day..with your blog. 0% investment 0% work. 100 present earnings. Just waiting for your approval. Always for ready for anything made with mirchi!